Higher Tregidden lies in a secluded valley to the south of the Helford River on the Lizard Peninsula. The Lizard is unique, an ancient and mysterious place where dramatic coastline, beautiful sandy beaches and rocky coves edge the rural landscape. The ideal place to escape to for a holiday. Both James' and Cob Cottage are beautiful, traditional Cornish cottages with thick walls, beamed ceilings and loads of character. They are a real homely and cosy place to stay. Both the cottages at Higher Tregidden have their own outside spaces, but guests are welcome to explore and enjoy the surroundings. There are seven acres to explore including a meadow, orchard and woodland. It is great for children to run around! The Owner also has a large pizza oven and will fire it up on arrangement. Ground Floor: Open plan accommodation with beamed ceilings. The living area has two comfortable sofas, coffee table and side furniture. The dining area has a table & chairs for six. There is a well equipped kitchen. 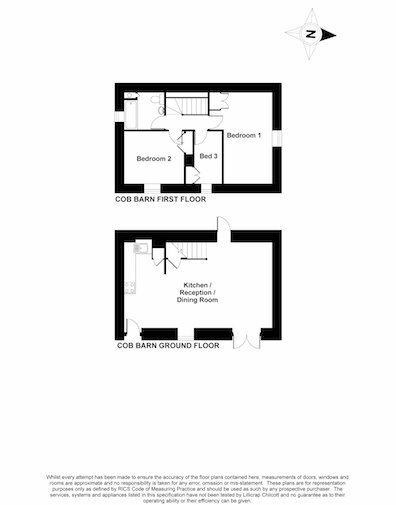 First Floor: Large double bedroom with 4'6" bed. Twin bedroom and children's bunk room. All the bedrooms have built in wardrobes. The bathroom has a bath with over bath shower, WC and basin. Exterior: There is a garden area with furniture. Please note that the garden is not enclosed, although the site is very rural. A BBQ is available. Ground Floor: The living room has an open beam ceiling, two comfortable sofas, armchair and side furniture. The kitchen/dining room has a table and chairs for five. A door leads to bedroom two on the ground floor with twin beds, wardrobe and drawers. First Floor: Double bedroom with 4'6" bed. Children's room with a cabin style single bunk bed, only suitable for a younger person. All the bedrooms have built in wardrobes. The bathroom has a bath with over bath shower, WC and basin. Heating is via central heating. The kitchen is well equipped and has an electric oven & hob, kettle, toaster, microwave, fridge and dishwasher. 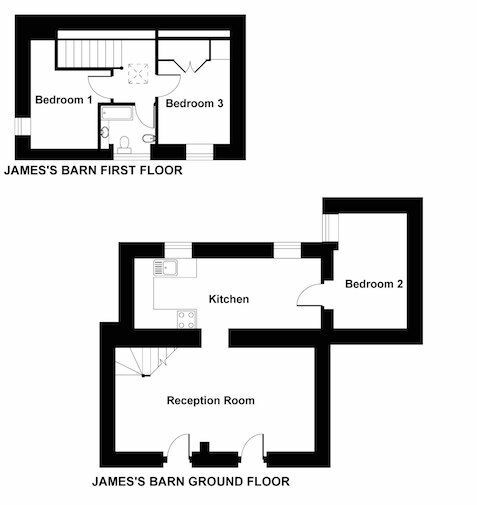 There is a shared (with James' Cottage) separate utility room with a freezer, washing machine and tumble dryer. The sitting area has a flatscreen, digital Freeview TV & DVD player with CD & Radio. WiFi is available at the property. There is a cot & high chair. there is an iron & ironing board available. Heating is via central heating. The kitchen is well equipped and has an electric oven & hob, kettle, toaster, microwave, fridge and dishwasher. There is a shared (with Cob Cottage) separate utility room with a freezer, washing machine and tumble dryer. The sitting area has a flatscreen, digital Freeview TV & DVD player with CD & Radio. WiFi is available at the property. There is a cot & high chair. There is an iron & ironing board available. Electricity, heating, bed linen and towels are all included. There is parking available for up to 4 vehicles but there is more parking available upon request. Up to 2 well behaved dogs are permitted at EACH of the cottages for the small additional cost of £25 per dog / per week, but please remember that you cannot leave your dogs unattended at the property alone. £400 pre authorised to your credit / debit card as a security deposit is required. There is a good pub - the Prince of Wales at Newtown, just over a mile away or a 20 minute walk, plus more pubs in nearby St Keverne, Coverack and at stunning Cadgwith Cove. There are large supermarkets in Helston and good shopping further afield in Falmouth and Truro. Coverack has a traditional working harbour, a general store, Internet Cafe, friendly pub and several eating establishments. There are many other beautiful villages to discover around the Lizard such as St Keverne, Porthallow, Manaccan, Helford and Gweek, all with excellent pubs. There is a brewery at Coverack for beer lovers! There are a number of good eating establishments dotted around the peninsula. "South" at Manaccan is a good find, plus "New Yard" at Trelowarren, "Kota" and "Amelie's" at Porthleven, not to mention the inevitable Cornish pasties - Leggy's in Ruan Minor or the famous Ann's Pasties at Lizard. The Lizard is an 'Area of Outstanding Natural Beauty' and has some spectacular coastal walks. It is England's most southerly point and the highlights include early Spring flowers, the Lizard lighthouse, swimming and surfing from sandy beaches, delightful fishing coves, sailing on the Helford river, heather covered moors in Autumn, open gardens and National Trust areas, pretty harbour lights at Christmas, friendly pubs and good, fresh, local food! There are loads of places to visit and highlights include Lizard Point, walks along the coastal path, a visit to Trelowarren Estate, the fascinating Goonhilly Earth Station, Flambards is great for the kids and you can step into Cornwall's mining heritage at the Poldark Mine. There are so many activities to choose from locally. You can take a boat trip across the beautiful Helford River and explore the gardens at Trebah. There are sea fishing trips from Porthleven. There is great diving on the Manacles and coasteering is available for the really adventurous. The Lizard is home to the Cornish Chough if you like a spot of bird-watching. The coastline has many pretty coves and beaches to discover, but you can find great surf at Porthleven or Loe Bar. What a wonderful week we spent in Simon and Alexandras cottages in the beginning of April! We went with our three kids (2, 6 and 8) and our friends with same size family. The location on the isolated Lizzard peninsula was exactly what we needed: off the beaten track, quite isolated so safe from the cars and traffic, so the kids could be be quite independent, beautiful surroundings and views, very peaceful. You (and the kids) can easily spend few days without even leaving the grounds as there is so much to explore and enjoy: each of the cottages has its own garden, there is a small hill if you want even better views, there is an orchard where you can have a picnic, there are donkeys you can befriend, there is a wild patch of woodland with a small stream where kids can build a den, play around the stream, no to mention fully equipped playroom in a separate building. Despite having 6 kids with us we could still enjoy a quiet glass of bubbly in those peaceful surroundings. The whole place feels really idyllic without being manicured. All the attractions of the Lizzard are within a short drive. The cottages are really charming, fully equipped, perfectly clean plus we had lovely local products waiting for us upon arrival. Simon and Alexandra are wonderful hosts and very helpful with their knowledge of the area. We enjoyed our stay very much, kids keep talking about walking in wellies up the stream and the donkeys - thank you so much Simon and Alexandra, we would love to be back. The cottage and location was absolutely amazing. We were a large family with lots of kids who loved every day. The cottage and the gardens/fields provided so much for the kids to do. Simon (owner) was great. He spent time to show us around and tell us about the area. The kids also helped Simon look after the donkeys and chickens. Great stay and looking forward to booking it again for next year. It is rare to find a location, property and host who can offer such a tranquil holiday. Higher Triggeden cottages are very attractively presented in a beautiful location. The decor is tasteful and furnishings are very comfortable. Our children had a true sense of freedom within a safe setting. The animals; three golden retrievers, horses and chickens made our stay magical. Simon our host was utterly charming and affable. I would highly recommend staying at the cottages.